All-purpose flour is a blend of hard (high-protein) and soft (higher carbohydrate, lower protein) wheats, with the bran (outside coating that protects the wheat berry) and germ (the embryo of a new wheat seedling) removed. All-purpose flour has a medium protein content of 9-12 percent, compared to whole-wheat (14 percent), or cake flour (5-8 percent). 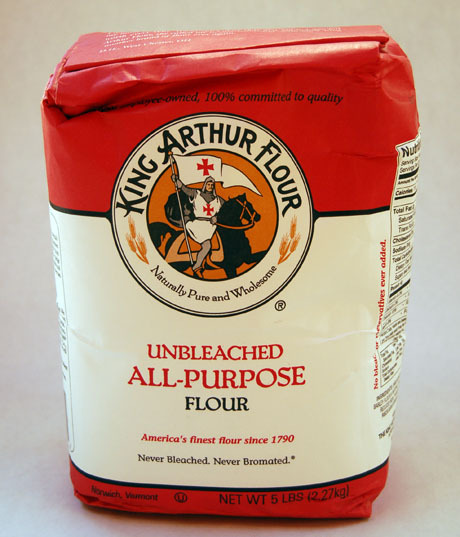 The King Arthur unbleached all-purpose flour I use contains 11.7 percent protein. On its own or in combination with whole wheat or white whole wheat flour, all-purpose flour works for most any baked goods, and the high starch content makes it an ideal thickener for sauces, stews, and coatings. I like the clean taste of unbleached flour; bleaching makes the flour whiter in color, but I'd rather have my bread taste good than shine in the dark. And, because I don't bake often, I buy flour in five-pound bags, decant it into one-gallon glass jars, and replenish frequently. One piece of advice: be sure to include a piece of the bag, or label your jars. Once decanted, one flour looks much like another. From the pantry, you'll need: onions, eggs, all-purpose flour, thyme, kosher salt. Sounds good to me! And definitely healthier than the ones with white potatoes! Funny, I must like grating down to my knuckles... I've learned the hard way how to be careful. At least the injury isn't as bad as the mandoline blade leaves. This will be the year for sweet potato latkes. I found some grown locally, which I didn't think was possible (short growing season, late planting weather), but they taste just like the real thing. Sweet potato fried have us conditioned to crave them. Kalyn, healthier, and more orange, too! Susan, I grew up with the "grating to my knuckles" method, and there's nothing that compares with it!